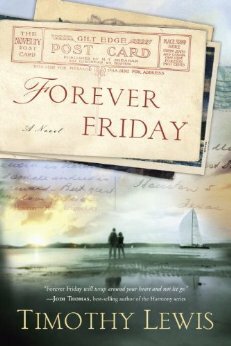 The book I want to tell you about today is Forever Friday by Timothy Lewis. This is the first book I have read by this author, so I didn’t know what to expect, but I was intrigued by the title. In the summer of 2006, owner of an estate-sale business, Adam, discovered quite a treasure when going through leftover belongings of the Alexander estate. It is an album of postcards. However, these are not your typical tourist postcards, with the cheesy, “wish you were here,” scrolled across the back. These postcards document a miraculous love between Gabe and Pearl Alexander. Gabe sent Pearl a love poem on a postcard every Friday for 60 years. The idea of this kind of love intrigued recently divorced, Adam. He longs to not only find out more about this couple, but also what their secret to lasting love. How did it work for them and not him? Through the course of this book, Adam discovers lots of information, but does he unearth the answer to his burning question? I thought Timothy did a great job with this heart warming story in Forever Friday and I would recommend it. If you would like a sneak peek at this book, click here to download the first chapter. I just went to my library website and they don’t have the book cataloged yet, so I will put it on my wish list to read! Thanks for posting this! It’s always fun to hear what others have to say about books….especially those I would never know to even consider reading!